Travel brochure for Bern - Zentrum für Alpen Flüge, 1930. Published by the Verkehrsverein der Stadt Bern. Signed "E. HRII," printed by Verbandsdruckerei A.G., Bern. Front cover. Travel brochure for Bern - Zentrum für Alpen Flüge, 1930. Published by the Verkehrsverein der Stadt Bern. Signed "E. HRII," printed by Verbandsdruckerei A.G., Bern. Back cover. Flight schedule for the Schweizerische Luftverkehrs-Union (Swiss Air), 1928. Designed by "Dieber & Castelli - Zürich," printed by Polygraphisches Institut A.G., Zürich. Front Cover. Back cover with advertisement for the Jungfraubahn of the flight schedule for the Schweizerische Luftverkehrs-Union (Swiss Air), 1928. Designed by "Dieber & Castelli - Zürich," printed by Polygraphisches Institut A.G., Zürich. Back Cover. Travel brochure for Berne, 1930. Published by the Berne Society for the Development of Tourist Traffic. Signed "Egon Kager." Front cover. Travel brochure for Berne, Centre for Alpine Flights, 1930. Published by the Berne Society for the Development of Tourist Traffic. Signed "Egon Kager." Back cover. 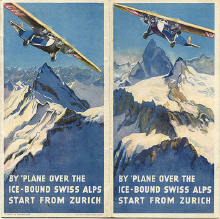 Travel brochure for Ad Astra - Swiss Airlines flights "By Plane Over the Ice-Bound Swiss Alps - Start from Zurich," 1930. Unsigned, printed by the Art. Institut Orell Füssli - Zürich. Front cover. 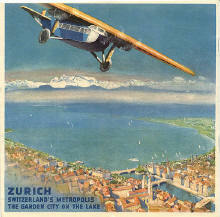 Travel brochure for Ad Astra - Swiss Airlines flights "Zurich Switzerland's Metropolis - The Garden City on the Lake," on the back of the brochure "By Plane Over the Ice-Bound Swiss Alps - Start from Zurich," 1930. Unsigned, printed by the Art. Institut Orell Füssli - Zürich. Back cover.